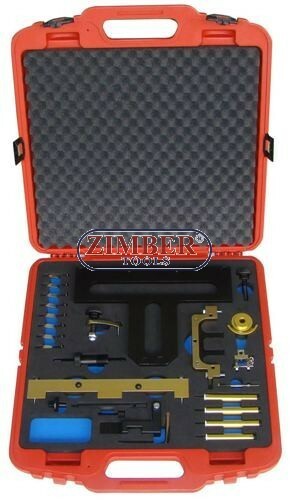 Trusa de fixare distributie BMW N42, N46,N46T ZR-36ETTSB01 - ZIMBER-TOOLS. Type series: E87 - 118i - 120i - E46 316i - 316ti - 318ti- E90/E91 - 318i - 320i. E85 - Z4 2,01. Pentru motoarele pe benzina 1.6/1.8/2.0. Compatibil pentru modele: 118i/120i/316 Compact / 318i/320i/Z4/X3 (2001-2010). Trusa de fixare distributie BMW. E90/E91 - 318i - 320i. E85 - Z4 2,01. Compatibil pentru modele: 118i/120i/316 Compact/318i/320i/Z4/X3 (2001-2010). Set for Professional Engine Repair BMW N42 / N46 / N46T. Engine timing: checking and adjustment. VANOS unit: removal, installation and alignmnet. Suitable for the following application: camshaft installation and removal as well as removal and instalation of the inlet camchaft and carrier assembly / Valvetronic Sistem. Easily accessible operating instructions including cross references to original part numbers. 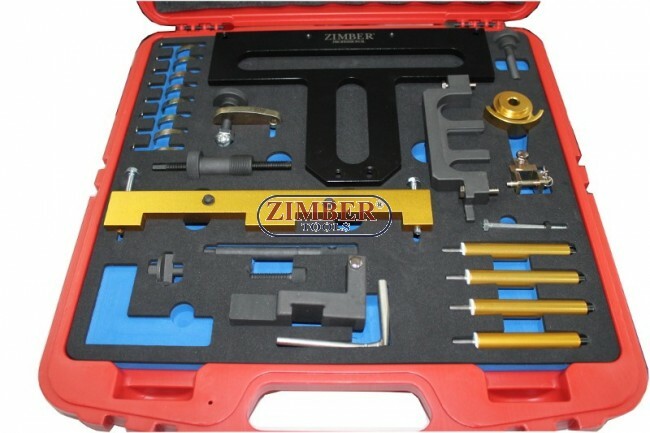 Clear arrangement of tools in high-quality plastic case with foam insert. BMW: E87 118i / 120i - N46 engine. E46 316I / 316ti / 318ti - N42 engine. E90/E91 318i / 320i / N46 engine. E85 Z4, 2.01 - N46 engine. Trusa pentru montarea si demontarea sistemului Valvetronic BMW N42/N46/N46t - (ZR-36ETTSB05 ) - ZIMBЕR-TOOLS. Set fixare distribuţie BMW N42, N46, N46T - VANOS (ZT-04537) - SMANN TOOLS.